Just bought a Sony A300 or A350 and looking to combine practical know-how with inspiration? This one-stop, easy-to-read guide covers all the basic functions of the camera, and everything beyond. For the basics, turn to the quick start guide, which will get you up and running in five minutes. For an understanding of your camera's many controls and features, check out the section called "The Camera." If all you need is a quick explanation, you'll find it. If you're looking for the Whole Story, you'll find that, too. Settings that affect how your pictures look are accompanied by full-color examples that show you exactly what you can expect. This section also covers the camera's menus, playback features, memory, and power sources. The section called "Software" shows you how to get the most out of your camera's software. It covers tethered shooting, color management, RAW conversion, storing your images, managing your library, and backup strategies - to name just a few topics. Ultimately, this book's greatest strength isn't its focus on the camera or the software; it's the detailed, easy-to-follow instruction it offers on using your camera to take truly superior photographs. 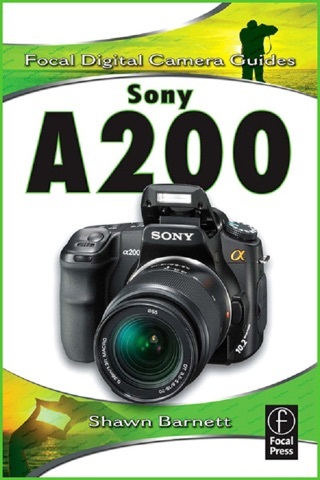 Sections devoted to lenses, subject matter, and light cover these variables in depth, always presenting the most effective techniques in the context of the Sony A300/A350. 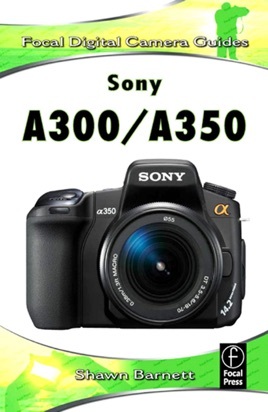 Written by a widely acclaimed photographer, Sony A300/A350 shows you how to get the shots you can see in your head but have never been able to capture with a camera. * The quick start guide will have you taking great photos in five minutes. * In-depth coverage of every feature and control ensures that you have access to the tools you need for every shot. * Full-color examples demonstrate how different settings affect your photos. * Expert coverage of lenses, lighting, and subject matter gives you the practical knowledge you need to go after any shot. * Step-by-step instructions on photo editing and image management help you get the most out of your camera's software. * A detailed review of accessories for your camera explains which of these add-ons offer the most value for your needs. * Dozens of tips and tricks prepare you for every situation you're likely to encounter - in the field, at the studio, or at your next wedding or family reunion.